Electrical engineer Bob Schmidt joins Adam, Carmen, Brian and Jeff to talk about the importance of making a good impression, and delivering the intended message, with effective email. Jeff readily admits that he doesn’t use newer communication channels such as WhatsApp or Facebook Messenger. Brian has fond memories of filmstrip projectors from his school days. Our guest for this episode is Bob Schmidt, an electrical engineer who joined us previously for episodes about Troubleshooting and Ideas Without Words. As with most career professionals, it is important for engineers to be effective in their use of email. Bob’s book about troubleshooting, An Engineer’s Guide to Problem Solving, continues to do well for him. Brian is continuing to make use of Microsoft OneNote, having recently delved into it’s collaborative features. Brian admits sending emails with a blank subject line, but Bob says that’s inconsiderate to coworkers who must interpret the email’s subject and importance on their own. Carmen and Bob “tag” their emails by topic or project to ease subsequent sorting and identification of important information. Go ahead and change the subject line to fit the current conversation, suggests Bob. Our guest points out that blind carbon copy (Bcc:) recipients do not receive replies to the original email on which they were copied. Send carbon copy (Cc:) emails to individuals needing to know of an action or decision, but who are not directly involved in carrying out the action or decision. Send Bcc: emails to individuals needing a high-level alert that progress is underway, but without burdening them with subsequent discussion details. As a courtesy to other recipients, make a note in the email about who is receiving the blind carbon copy. Commenting on the dangers of using the “reply all” button, Brian mentions an email storm circulating at Time, Inc.
Bob suggest that engineers never send an “angry” email, noting that Abraham Lincoln would write “hot letters” that were never sent. Jeff and Brian wander into a discussion of whether electromagnetic pulses (EMPs) could wipe the hard drives on which emails are often stored. A great deal of corporate data from Sony Entertainment was made public in 2014. Brian has declared email bankruptcy. 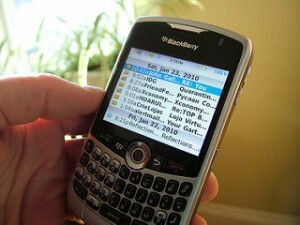 The group is general agreement that “SMS-speak” is not appropriate for professional email. Carmen shares his brief experiences with Slack, a cloud-based team collaboration tool. Bob suggests using HTML effects sparingly in work-related email. Carmen uses disposable email addresses from Guerrilla Mail to lessen the amount of spam that shows up in his mailbox. Jeff mentions the self-destructing tape player featured in old episodes of the TV show Mission Impossible. Bob can be reached via his Pretty Good Problem Solver website. Thanks to Ian Lamont for use of the photo titled “BlackBerry email on the BB 8330.” Opening music by John Trimble, and concluding theme by Paul Stevenson. I have to admit, I tapped out pretty early on this one. An hour dedicated to e-mail etiquette. Sorry our email episode didn’t float your boat, Joe. Perhaps you’ll find the next episode more to your liking.